Record your Storm Knight's journey! 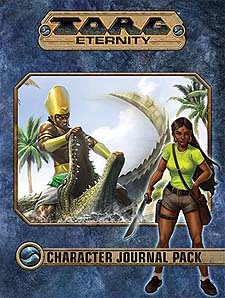 The Torg Character Journal Pack contains a tear-pad of 50 standard character sheets, great for quickly creating new characters or important personalities for your Torg Eternity campaign. It also contains eight extended four-page character sheets. Each of thee sheets has space for tracking advancement, recording the places the Storm Knight has visited, and important enhancements like spell details or vehicle statistics. Each of the eight sheets is themed for a different cosm, giving your Storm Knights a unique presence on the table! Eight extended, 4 page character journals, each themed for a different cosm.